Earth Day is just around the corner. Looking for a hands-on way to care for creation? Whether you have a small patio garden, a vacant lot, or a patch of soil at the edge of your parking lot, your faith community can use your outdoor space to help conserve and restore wildlife habitat. 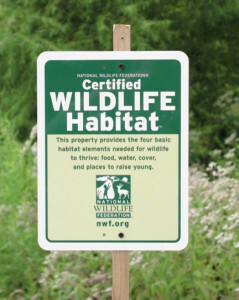 The website of the National Wildlife Federation offers specific guidelines on providing for the four key elements that wildlife need – food, water, cover, and a place to raise their young. 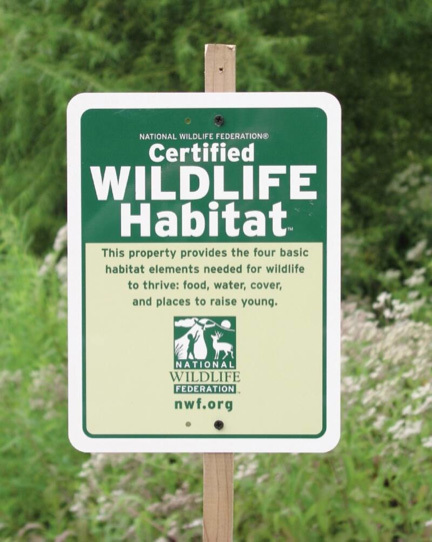 Find out how you can create a garden that not only provides a haven for birds and butterflies but also qualifies to become an official Certified Wildlife Habitat. That�s just what one member of New York Interfaith Power & Light did in downtown New Rochelle. The members of the Empty Hand Zen Center transformed a small, fenced-in parking lot (just big enough for two cars) from lifeless gray to a flourishing beautiful garden that changes with the seasons. Tended with love by the members of this community and led by their teacher, Jion Susan Postal, they created this garden � bucket by bucket of soil � on top of the asphalt along with a diverse array of evergreens and willows in pots, bird feeders, a bird bath, a compost bin, and a small table and chairs for tea. They created what Susan lovingly called a �wild garden,� a place of refuge for people and wildlife alike. The sign on the gate makes this transformation official: this is a Certified Wildlife Habitat.